Is this Jaw Dropping Beautiful or What? My first creation with the Nestibilities. Techno-Takeout giveaway for my birthday. Birthday RAKS-- and other happy mail! More Monday Sketch Challenge Cards. A late one and guess who it is, lol! So Happy For You and Baby Too! A quick birthday card-- and more sketch cards. Be Happy Spring is in the Air! Couple more sketch challenge cards. Thanks again to everyone who has played along so far. Today's challenge was to use the layout from the Sympathy card on page 44 of the current SU catalog. I love these challenges because I don't notice what great samples are in the catalog if I am not prompted to. I wonder why that is. This was an awesome layout! My favorite thing about the layout was the torn corner so I was sure to keep that part the same. I hope you like it. I am always needing boy cards so this one will actually be in my stash! Got to love that! The wings on the dragonfly are mildly glittery. I used a clear glitter pen and it gave it just enough shimmer that it is still "boyish". Unfortunately not enough to show up in the picture though! I wanted to post this one right away because I so love the ribbon flower on it. You have to check it out. I have been wanting to do one of these for a while but have not found the time. So at least you can see it here and who knows maybe I will get one done some day to share too, lol. Another Monday Lunchtime Sketch Challenge #6 card. I received this card in the mail a couple of days ago and my jaw actually hit the floor when I opened it. It is just absolutely stunning in real life. I can not believe how absolutely beautiful it is. Look at the shadow and all. The colors are wonderful and she even stamped the flowers again on the inside in a light color and then the greeting over the top. This is a real WOW card. Thank you so much Laura! I just love it. All of the detail are perfect! I wanted this set and talked myself out of it-- now I am confused-- I am not sure I could make a card THIS nice with it so maybe it was a good choice not to get it originally! Thanks again Laura, you are just too sweet. This is just a quick and simple card. I finally got a couple of the Nestibilities from my hubby for a combined Christmas, Valentines and Birthday gift. I had to see how they worked. Too fun. Stamp set used: A Little Birdie Told Me. Pretty simple so I am leaving it at this. If you have a question feel free to ask. Here are four more cards for this weeks sketch. You can find the original post and sketch here. Come one and play along! Here are a few more cards for sketch number 6. Great job ladies. I am up to my neck in elements for a card I need to do for a swap. Only need 12 cards but of course there are too many pieces to this silly thing and I need to get it postal today so we shall see if I have time to get anything else done! Where is yours? I can't wait to see it. Don't forget to comment here so I can post it for everyone else to see too. I'll be watching for it, lol! Here are two more links. I had to run to the doctor, still sick- YIKES this is three weeks. Sure is a good thing I don't have much to do during the day so I can sleep. Anyway sorry I posted a bit early girls, I know that are some that are just like me and are working right up until the deadline so here are a few more. It's that time again! Time for the lunchtime sketch challenge. I really like this layout although I think it is a bit intimidating at first glance. I will be making another one with it soon. 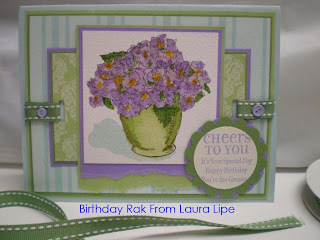 I actually did a card with NO STAMPING! Got to love these new rub ons. I was a hard sell for them at first because I was thinking why? Why not just buy a stamp and do it any color and over and over again. But did you notice how wonderful these images stand out and the fact that there is no Whisper White of Vanilla card stock! Those images really pop on the Chocolate Chip card stock. Plus you can use them on so many other things. I have even seen them on people's nails for nail art, mirrors, windows, glass, candles, computer mouse and monitor, refrigerators, the list is endless and I am sold! Feel free to play along, we would love to have you! If you load to SCS please use the key word TSSC6 no spaces. And be sure to leave a comment here so we can all see your work. Have fun and Happy Monday! Is this cake not the best looking cake you ever seen. It actually made me cry. 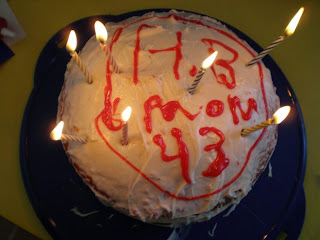 See we really don't ever do anything to celebrate my birthday so I was so excited to see this beautiful cake that my 8 year old son made by himself. I was not allowed in the kitchen except to put the cake in the oven and take it out of the oven. He did such a fabulous job and even put my age on there -- hence the guessing game for this Techno Take-Out. I knew I had to share this cake with you guys so figured I might as well make a game of it. Well, my guess is going to be close to my own age, I say 42?? You were so close too. Congratulations Melissa! e-mail me with your address. Here is the last sample for sketch 5. Get ready for sketch 6 in about 2 hours. Thanks to everyone who played this week! Another Blogthing -- I love some of these--we all knew I was a little weird. Alright you guys this is my last post for today. I need to go celebrate my birthday with my family. But I thought it would be fun to do a little contest type of give away. I am gonna give away the brand new limited edition SAB rub ons to one lucky winner. 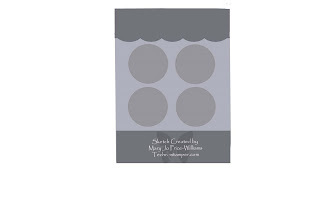 There are four sheets in the package--one Chocolate Chip, one Old Olive, One Whisper White and one Basic Black. You can see them here. All you have to do to be eligible is to guess how old I am today? I will take all the correct answers and put them in a hat and have my son pick one. Good luck and remember only one guess per person and PLEASE leave your name if you are posting anonymously. Good luck I will pick a winner right before posting the new sketch challenge on Monday morning. So all entries must be in by 11 am est. Monday. I am off to celebrate. I still have more of these to post too! Don't forget that the new sketch will be posted on Monday at noon EST. Hope you play along. There is still time to do this one too. You can find this sketch here. not only is this card stunning but what a great name for a blog! Thanks for playing ladies, your cards are great. this first one is from Pat Huntoon at The Technique Trail. This card is just stunning in person. The background is so shimmery. 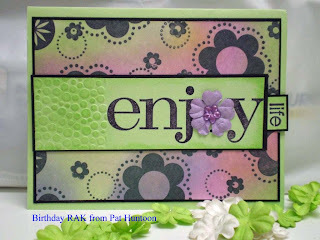 I love the colors and the partial embossing on the sentiment strip is brilliant! I just adore it. Pat participates on my weekly challenges and also is the owner of the Techniuqe Junkie Newsletter I was telling you guys about last week. Here is the links to both here website and blog. I am proud to say that this creative individual is my friend! Thanks Pat! I can't wait to see ya again at the Cape this year. 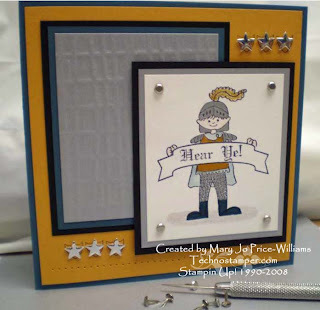 This next card is from another extremely talented stamper and dear friend of mine Holly McMillen at Toyzhaven. I am sure any of you who visit SCS know who Holly is. I will get to spend a whole day with Holly and other's during April for the SCS get together in Western New York. Feel free to ask me for more details if you think you might be interested in joining us for the fun day of stamping. We would love to have you there! and of course she added that super cute card too. This card is great, I may have to case it for an upcoming class I have. Thanks Barbara -- love ya baby! I am late with this. I am so sorry. The challenge for this week was to use Brilliant Blue, Old Olive and Purely Pomegranate. 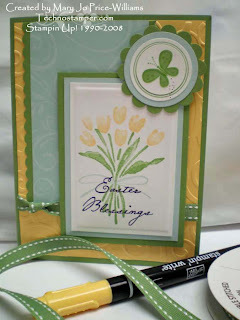 I thought I would make this difficult challenge a little harder by making it a double challenge and mixing it with the SCS challenge to use your own handwriting on a card front. So when I stamped the star I omitted the part that said Happy and wrote in You are a...the word star is a iron on that I found at the dollar store. I covered the star that was on the iron on with the paper layered one I made instead. Fun and bright, my kind of card. My son will be using this for a Birthday party he has to go to today. Other: Iron On, white gel pen and markers. I will be back soon with some more posts. Today is my birthday and I will be doing a birthday give away. 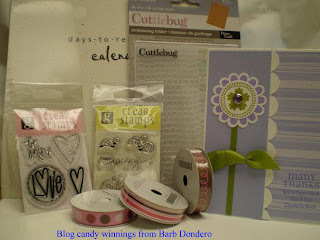 Also I have a few RAK's to share from some friends and I won some awesome Blog Candy on Barb's Blog so I need to show you that too! Don't go too far. Sorry about that. I missed this one on the last posts. Can you believe all the great cards with this sketch. It was a hard one too! I am so impressed with all of you! Here are the latest versions. be sure to click on this one for a close up, lot of details that didn't show up small. I know that it is Friday and this post should have started with my Blogger's Challenge card but it will not be up till later tonight. Sorry, too much sickness going on ALL AROUND ME! I will be back later with that one so don't forget to check back. TGIF! The best part about this card is that I had this idea right away when I seen this new Pun Fun set but kept putting off ordering it for other things. Well I just got it two days ago and was messing around with it for a swap I need to do. 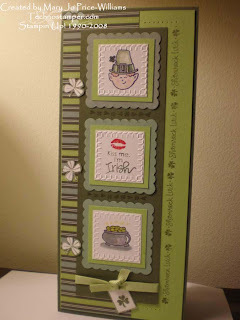 Well the swap had a "bit" of coloring --and I got bored so I decided to take a break and see what the challenge was today on Splitcoaststampers and to my amazement it was a window card! I knew I had to stop everything and make this card. Here is the inside view. What a fun card! Hope you enjoy it as much as I do. I have a few more samples for the sketch of the week to upload later but need to go spend some time with my son. See ya soon. Hoppy Day to you and my frog friends! -- Plus more Monday Lunchtime Sketch #5 cards. This is for both CC154 and SC164 on Splitcoaststampers. I colored the frog with markers and clear embossed him so he is shinny and slimy looking. The cat tails are puffy too, I tried to make one look like it exploded but it kinda looks like I made a mistake so I may try to scratch that part off later. Thanks for looking. Here are some more Monday Lunchtime Sketch Challenge #5 cards! and then Linda left a comment saying she played but there is no link? Contact me Linda cuz you know we are dying to see it now! Thanks to all of you for playing. Anyone else game?????? Don't forget to leave a comment so I can share! Thanks for stopping by today. Be sure to check out the original post here as well as all the add ons in the posts between. Thanks so much for playing ladies. Did you make a card with the sketch? Don't forget to leave me a comment so I can share it with everyone else. One more quick one for me. I wanted to use up the rest of that 12 inch strip that I cut for the last card. I also found another piece of this in the scrap pile so I got to reverse it for the background. So fast and easy, got to love it. I don't think it is the best picture but I really have to get my studio cleaned up for tonight's Technique class so I don't have time right now. If I get a better picture I will edit later. Oh and check out this great card done with the sketch too. Well, I am finding it hard to believe it is Monday again! I checked my calendar twice and it does seem to be true. I have been so sick this whole week and don't seem to have a clue what day it is or what the heck happened to the week. But the good news is that it is indeed Monday so I have another sketch challenge for you. This one was a bit tough for me. Not sure if it is because I am sick or because of the sketch? Anyway, I can not wait to see what you guys do with this one. The base of the card is Chocolate Chip followed by River Rock. The dp is cut on the design to make the zig zag strip. I then used my marker to make dots along the edge. The butterfly is from the Happy Hearts set -- I just omitted the words I Love You and added more dots. The wings are paper pieced with a tiny scrap of the Outlaw paper. The saying is from the retired set Blooming With Happiness. And finally I added double stitched Wasabi ribbon. Oh and the grass is a Wasabi scrap. 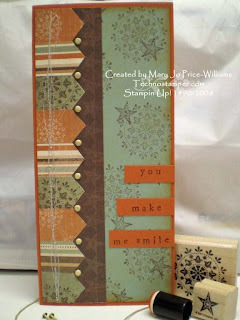 Love this layout for using scraps. See the next card too. Here is a close up of the flowers so you can see how I cut the circle. And here is my second card for this sketch. 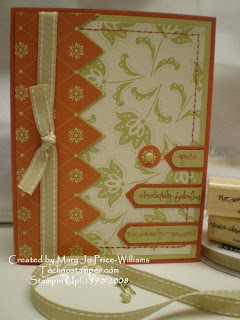 I used the retired Outlaw designer paper scraps that I can not stand to throw away! The base of the card is Really Rust followed by Sage Shadow. 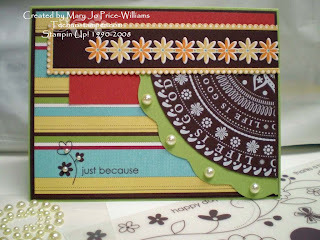 I randomly stamped the star and medallion from the Wanted set in Chocolate Chip on the Sage Shadow card stock. Then I sponged Really Rust on the edges. The left hand side is done with nine 1 inch by 1 1/2 inch scraps of the Outlaw paper. I cut a template so that I would get all the points the same. I attached them to a larger stip of the Chocolate Chip star patten from the same series. Next I stitched in a VERY random design to hold all the pieces down. And finally I added 8 vanilla brads in between the points. You make me smile from Simple Sayings II was stamped on strips of Really Rust and attached to finish the card. One more to add to my Male Gender selection! A few less that usual but hopefully the rest will jump in a little late. The one's I am showcasing are terrific though. So don't' you want to play too! Post a comment on here with a link to your sample and I will add it to one of the posts during the week. 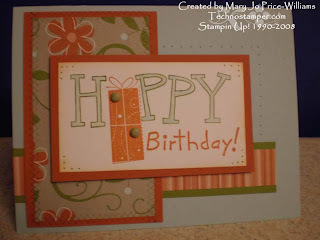 You can upload your card to your blog, Splitcoaststampers (using TSSC5 in key words) or where ever you choose. I hope you do join us. It will really get you thinking out of the box. Now, I have one more piece of that Apple Cider dp already cut so I may have to create one more. 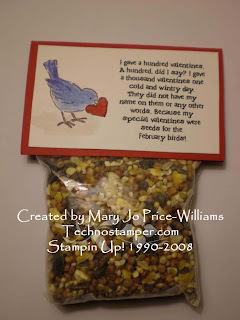 We are on the final minutes before the next sketch challenge but first I need to post this link to Pat's blog that has a whole slide show of cards done with the Monday Lunchtime Sketch Challenge #4 -- these cards are wonderful! Don't go too far, the next post will be up in a minute so hurry up and get yourself a cup of coffee and get back here to see the wonderful samples for sketch challenge #5. One of the girls who plays in my sketch challenge has her own stamp line. Of course I had to support her as she does me. So Here Ye go check out the stamps over at Sweet and Sassy Stamps. She has some awesome Christian Sentiments amongst other stuff. Isn't this set just adorable. I have five boys in my Cub Scout den including my son and all of them will be going to Summer Camp this year -- the theme is Knights at the Round Table. How great will this set be for scrapbook pages, name tags and other such fun items. Love it. Almost forgot to mention that his is for the FS54 Challenge on Splitcoaststampers too. Here is the card that inspired me. Aren't these just the cutest! This is more of the candy treats for my son's teachers. Those little boxes held two layers of nuggets! 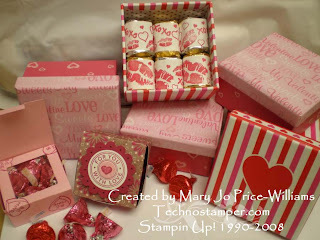 And the other boxes are those peek a boo boxes with kisses. Too cute. My studio is still overflowing with candy from all of these and that is not a good thing. My teeth may fall out very soon, lol! Here are a few more samples for Monday's Lunchtime Sketch Challenge #4. New sketch tomorrow at noon! I better get my sample done! Hmmm, can't decide it I like the colors here. I was good till I added the Red and River Rock. What do you think? This is a new technique from the Technique Junkie Newsletter. The technique is called Magic Pattern. I think I like the technique just not sure of the card? Here are some more cards for Monday Sketch Challenge #4. You still have time to play. 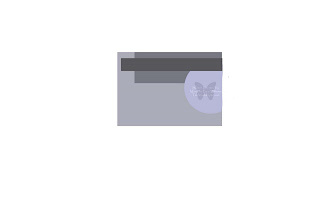 Follow the link and then create your card. When you are done leave me a comment with a link so I can post it here. Blogger's Challenge 34 -- yep it is Friday again! 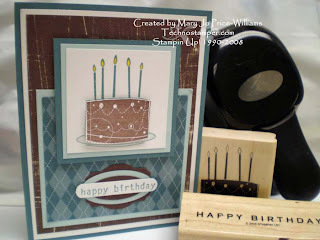 Today's challenge was to use the layout on page 42 of the Spring-Summer Stampin Up catalog -- the Happy Birthday card. I decided to use a stamp set I bought a few weeks ago but have not used yet. It is called Birthday Wish and it is by Inkadinkado stamp set. Hope you like it. I am off to the doctor--have some horrible respiratory infection and need meds. So I am keeping this brief and to the point, lol. Other: Paper Piercer, hand held circle punch, scallop circle punch, ribbon, and mini faux brads. Don't forget to check out the other cards done by the rest of the group. The link in on my sidbar under the logo Bloggers Challenge. I will be back after the doctor to share more samples of Monday's Lunchtime Sketch Challenge #4. Have you ever been in complete awwwww over the creativity of some people. I often feel this way with my (cyber) friend Lauren. She is so amazing and has come up with some of the most creative things ever! I just fell in love with these little onsies she made last week and I knew I had to find time to try them out. Well I was so excited to remember them this morning as I was preparing for my club tonight. I needed one more project and and honestly I did not feel like thinking too hard (I have been kinda sick AGAIN). So this was perfect. So for you club girls tonight we are gonna learn how to make these awesome cards. For the rest of you that want to know how to make them head on over to Lauren's blog and check out her tutorial! Where is yours? You need to leave me a comment if you want me to showcase it on here. Few more for this weeks sketch.--and a question for you. Here are a few more, I am trying to decide if it will be easier to post the pictures with a link or just the links. I have received a few comments that it is a bit tedious to go back and forth. So I am asking this question: As someone who just reads would you rather surf the blogs that are participating or would you rather have the pictures here and links for you to go if you choose? For those of you submitting, would you care which way it is? Let me see what you created! Don't forget to let me know what you think of the above by commenting here. I have a super busy day so I am not sure if I will have time to do another post today or not. We shall see. Till then, keep warm and have fun..
isn't this fun to see all the different ideas. I hope it is making you want to stamp. Don't forget to share what you come up with. Yea, just a tiny bit late this week but it was worth the wait. 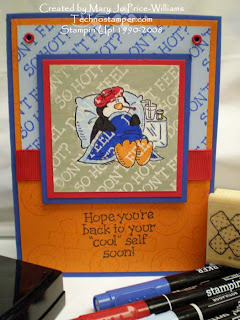 Here is Pat's card and of course it showcases a technique in her latest Technique Junkie newsletter -- I told you you should get it. I am on a male Birthday card kick. Need to increase my stash so this is what I came up with. The background is a spin on a technique that I originally got from the Technique Junkies newsletter--it was called Triple Mosaic. 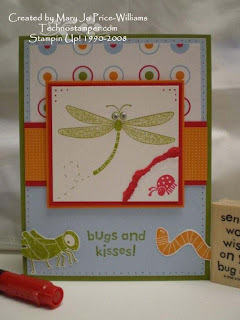 I added the twist of using the cuttlebug and actually did a tutorial here. If you are not a member of the Technique Junkie Newsletter you really should check that out. It is a terrific resource done by my friend Pat Huntoon. She also participates in this challenge and one of my designers that gets the sketch ahead of time to post with me. Since the only thing out of the ordinary on my card is the background and I already told you where to see that tutorial I am now going to move on to the other fabulous designers that worked with the sketch. As always I encourage you to play along. You can post it anywhere you want, you don't have to have a blog to play. If you post on Splitcoaststampers please use the keyword TSSC4. Don't forget to leave me a comment with the link so I can post it on here too. Can't wait to see what you come up with. The sketch looks much harder than it is. Have fun. Here are a few more for last weeks sketch. The new sketch will be up in about 8 hours. It is only 4 am here. If I missed you be sure to let me know and I will edit this post. Get ready for today challenge, I have seen some of the samples early and they are AWESOME! One more card for todays' FS53 challenge. 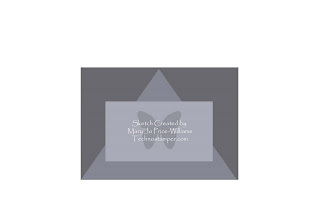 I love the way this butterfly looks embossed in white Here is the card I used for my inspiration. Accessories: small flower punch, Lg oval punch, Designer Label Punch, circle punches, scallop circle and square punch, photo corners punch white embossing powder. Today's Featured Stamper Challenge was a fun one. And just in time. 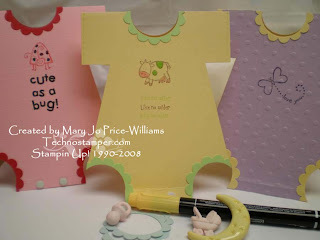 I wanted to do a baby card for tomorrows class and this layout was perfect. Fun Fun Fun.. Here is the card that I chose for inspiration. 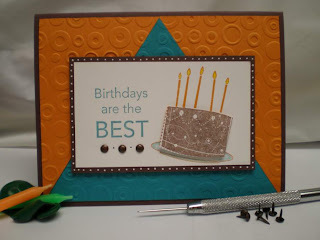 I made my own embossing plate to add the embossed ridge around my focal image. I used cardboard and my Big Kick. So easy and I love the look. Stamp Sets: Never-Ending Joy, Cause for Celebration and Riviting. Paper: Wild Wasabi, Soft Sky, Apricot Appeal Whisper White and Soft Sky designer paper. Other: Clear gel pen to accent butterfly, circle punch, scallop punch, cuttlebug, scallop blade for my Carl cutter, ribbon and markers. The new SAB sets this year really are fun! 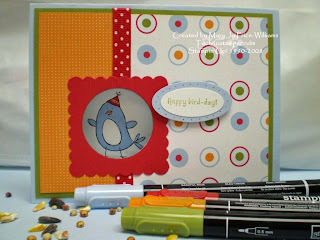 This is the Birthday Whimsy set that you can earn for free with a $50 order. I was looking for a male card and thought this set would work. The colors are Soft Sky, Blue Bayou, Chocolate Chip and of course Whisper White. 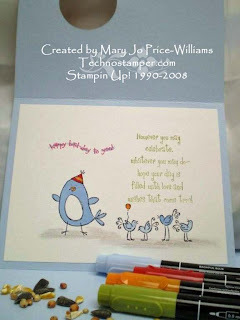 Stamp sets used are Birthday Whimsy and It's Your Birthday. 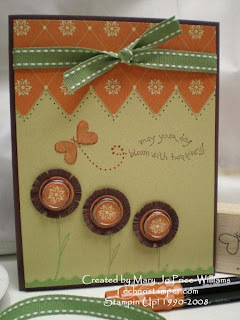 I used four punches for the sentiment--the designer label, lg oval, sm oval and word window punches. Since the happy birthday was longer than the regular word window punched size I extended it by stamping on a strip of paper that is just a hair under 1/4 inch wide. Insert the ends into the punch from the bottom and just cut off the end then repeat on other end. Hope this makes sense. Other than this is a pretty easy card. Hope you having a wonderful weekend. Answer to Jimi's question (can't find an e-mail for you) and a couple of other people have asked in the past few weeks for a clarification about the Blogger's challenge and the Monday Lunchtime Challenge without leaving an e-mail so I thought I would clarify here for all. In case you are curious too! The blogger's challenge is a group of woman who work on the same challenge each week and post to their blogs on Friday. Anyone can then play along and add a link to any of our blogs. There is a logo on my sidebar on the right. If you click on that it will show you all the players. The challenge changes weekly. This week was a color challenge. I also post my Monday Lunchtime Sketch Challenge each week. I post a card and sketch every Monday around noon (est.) and anyone who plays along and posts a link to my blog will be added to one of my posts. 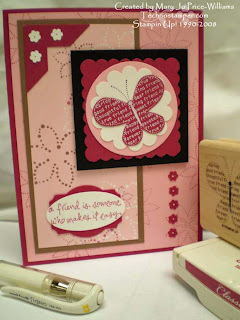 Challenges are a great way to expand you stamping style. They are so fun why not try one today. I would love to see what you come up with. Geesh, I almost forgot about this. I got up bright and early this morning and the first e-mail I read was one of my fellow players saying she had her challenge card up early. WHAT! Today is Friday already -- shoot, what was that challenge again? Oh yea, here it is....... Use Rose Red, Pumpkin Pie, Taken with Teal and Old Olive. Hmmmmmmmm........better get my you know what downstairs to the studio and get creative. And the good news is, I really like this card. Yippee! Look, I even staged my card. I have been thinking lately about maybe trying to get on a design team-- but thought I better try to get some better pictures of my cards first. Not sure this is a "better" picture but it does bring interest to the photo when you stage it. What do you think? Other: markers and mini black faux brads. The colored casrd stock was distressed by dragging the same color ink pad across the piece. The focal image is colored with markers so that I could have all the colors in the flowers. Don't foget to post here if you create one so I can link up to your creation for all to see. Thanks for playing. And just a reminder if you post to splitcoaststampers please use TSSC3 in the key word section. I am off to work on a few more cards of my own. See ya soon. 2. I Living in a cute condo with my best girlfriend, Stephanie.n school to be a makeup artist for TV/film. 2. 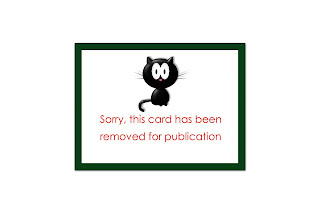 Clean this house -- before I go into my studio -- or maybe I could just make one card and then clean before I do any more??? Or maybe I could just clean tomorrow and stamp all day today -- YIKES, that is how this mess started in the first place, lol! 5. Drink more coffee! I know there are other more important things but without this I can't think of what they are, teehee. 1. Pay off all my mom's bills so she can just enjoy her life without thinking about what she can and can not afford. 4. Buy a new house. 5. Buy a mobile home so I can travel with my family and visit all the family and friends that have moved away from us. 5. Wool -- it itches! 1. Laundry... Does it EVER end?????????? AMEN to this one. 2. Picking up after others. 5. Rushing around all day everyday. This is the part that keeps me from playing this game, I don't want to post links to blogs and make them feel obligated to play so I thought I would leave this open to all of you. If you wish to play along let me know and I will edit to post your link here. There are many of you I would love to get to know better! Hope everyone has a wonderful day. This was a fast and easy card, we all need those once in a while! I began with the sketch challenge over at SCS. The focal image is created using a combination of the Big on Christmas set with Birthday Whimsy and a non Stamping Up! word birthday. I also used the All in a Row set. Here are a few more Monday Lunchtime Sketch Challenge cards too. 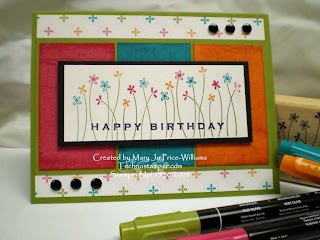 This is another card for Beate's Weekend Sketch challenge and also for the color challenge on SCS. Could not get a clear picture with the clouds in the sky. Fun card though. Here are a few more for my my Monday Lunchtime Sketch Challenge #3. Don't forget to let me know if you want yours linked here by leaving a comment on here. Week three already. What fun I am having seeing all these wonderful creations with the same sketch. Today's sketch was lots of fun for me-- I may have gone a bit over board but I still love it. There is a lot going on on this card, lol! 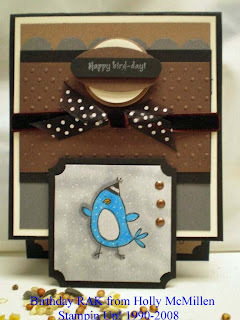 For beginners, I started with Bashful Blue cards stock and layered it with Basic Black. Then I attached a piece of Bashful Blue, Certainly Celery, Rose Red and So Saffron on to form the next layer. I used the All in a Row stamp set to make the stitching marks. 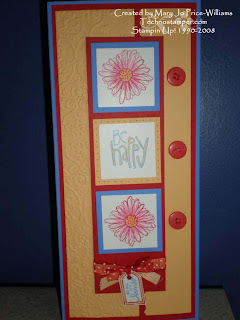 I used the slit punch to create the scallop from the polka dot Cutie Pie dp for the top. It needed something but my design was not leaving room for another layer so I added black dots around the scallops to tie in the dots around the flowers. The piece of dp on the bottom is also from the Cutie Pie collection. The the sentiment is a rub on from Colorbok. (Faith Blessing collection). Next are the flowers themselves. These are from the SAB set that you can earn for free this month. The set is called So Many Scallops and it is wonderful. I stamped the flower image in So Saffron, Bashful Blue, Rose Red and Certainly Celery then I stamped the dots from the other stamp in the set around them to add interst and make them pop just a bit more. 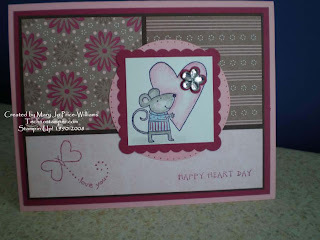 Next I stamped the flower from the Happy Hearts Day set on all four colors of card stock and punched them out. 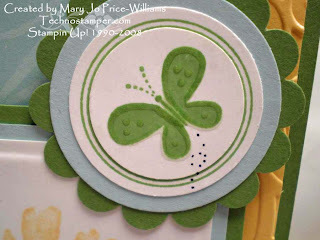 Now I used all four colors again to stamp the little flower from Little Pieces on Whisper White and punched them out. I layered all the pieces alternating colors on top of a Basic Black Scallop and added a black brad to the centers. I used the dimensionals to pop up all the flowers. And then the black and white polka dot ribbon is on the top ( no idea whose this is). So what do you think? Too much? I like it! 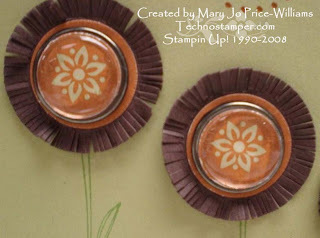 Come on and get stamping! You know you want to try it. When you do please post anywhere you want and then leave a comment here. Or e-mail me with your sample and I will upload it for you. 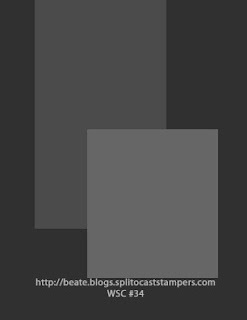 If you chose to use Splitcoaststamper please use the key word TSSC3 without spaces. Can't wait to see what you come up with! Sketch #2 can be found here The new sketch will be coming in a couple of hours! Get ready to play. There were lots others but the ones that are posted on my blog are the ones that leave a comment. I don't want to get caught up surfing around the web for who did and did not play. But I have so much fun looking at all the samples as I see them. There are so many different styles and tastes. They are all wonderful, and I hope that the sketches are helping you to get more stamping done and most of all have fun! Be back soon with today's sketch. Thanks for playing. This is my first ever St. Paddy's day card-- I'm Italian and German. But that don't mean I don't like the holiday! My card is a big one (9x 4 and 1/4). And my husband wants to know if he could get a reward for turning me into Stampin Up! 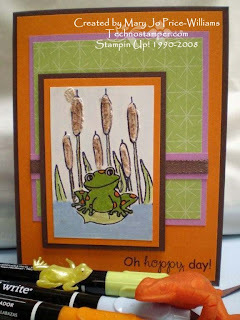 for using non-Stampin Up! stamps. He said he has the number ready if he does, lol! Isn't he just soooo sweet -- NOT! I am actually surprised that he had a clue. Surprisingly he noticed that the stamps do not stamp quite as clear and even as Stampin Up! 's do. Pretty observant. He was right about that though, each image was stamped three or four times before I had one that I was happy with -- but they are cute stamps. 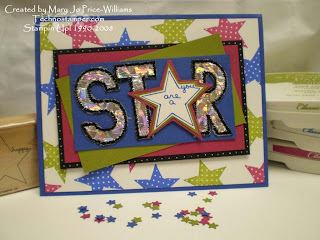 The are all from Studio G. The papers are of course all Stampin Up! The base of the card is Always Artichoke, then Certainly Celery. The side bar is the retired Wintergreen. 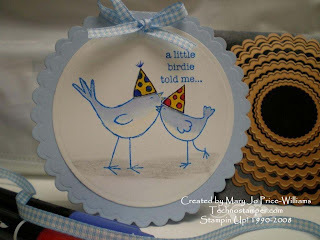 The focal images are stamped on Whisper White and then I used the little cuttlebug embossing dies to add the texture/faux stitching around the images. They are colored in with glaze pens and watercolor crayons. The images are then mounted onto Certainly Celery and then Sage Shadow that has been punched out with a large scallop square punch. 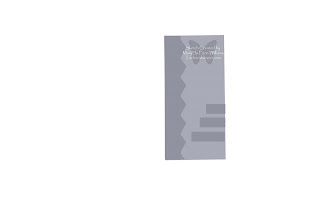 Other items used: Ribbon, paper piercer and mat pack. I know -- this looks familiar huh. I am back at last weeks sketch again. It is just such a wonderfully easy sketch to work with and I wanted another Valentine card to use at my clubs that are at the beginning of the month. This set really is adorable so I keep coming back to it. Hope you don't mind. Other: markers, circle punch, scallop square punch, watercolor pencils, blender pen, three for you punch box, Target bling. 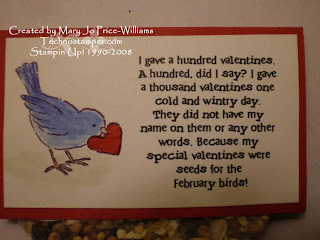 We make these adorable bird valentines every year for my son's class. They are such a big hit that the kids ask for them weeks before Valentines! Simple but oh so cute. Here is a close up of the poem in case you want to make them. How fun this challenge was! 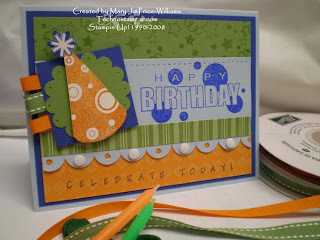 We were to use the Happy Birthday layout from the card on the front of the SAB brochure. I knew I did NOT want to do another Valentine or flower card so after searching around a bit I remembered the Moose You set! I really love this set and have only used it a few times so this was it's lucky day! The base of the card is Chocolate Chip followed by Sage Shadow. I pierced holes across the bottom of the Sage card stock and added a branch image in Chocolate Chip. Next is a piece of the retired Wintergreen paper. I so miss this paper the colors are wonderful. The focal image is stamped on Whisper White. I masked off the moose to stamp the trees behind him. I then stamped another moose head and cut it out and popped it up one the main image. I used Sage Shadow, Always Artichoke and Certainly Celery markers to make the ground. The whole image is mounted on Always Artichoke then Chocolate and finally a piece of zig zag cut Certainly Celery is behind it all. Other supplies used were, hodge podge hardware and twill tape along with the Lovely as a Tree set. Hope you enjoy and don't forget to click on the logo on my side bar to see all the other talented stamper's samples with this layout. I'm off to check them out myself. Hope you have a wonderful day --if you live around me try to keep warm, brrrrrrrrrr! !